HOUSTON — Space shuttle Endeavour's astronauts performed some early morning robotic arm work Saturday (May 21) to take another look at a small gouge in their spacecraft's tile-covered underbelly. NASA managers ordered the so-called "focused inspection" to obtain extra data required to clear any doubts over damaged tiles and confirm that Endeavour's heat shield is safe for the spacecraft's return through Earth's atmosphere at the end of its 16-day mission to the International Space Station. "There's nothing alarming here and we're really not concerned," said NASA’s chair of the shuttle mission management team LeRoy Cain on Friday. "This is one that we feel pretty confident we're going to be able to clear once we get some higher fidelity data." Once held by the shuttle’s own Canadarm, the boom was extended underneath Endeavour and positioned about seven feet from the 3.2 inch -by-2.5 inch (8.1-by-6.4 cm) divot, which straddles two heat shield tiles located between the orbiter’s right main landing gear door and an external tank feed line port. This NASA image shows the primary damaged tile on the space shuttle Endeavour that engineers are studying to determine whether any additional inspections or repairs are required while the shuttle is docked at the International Space Station during the STS-134 mission. This NASA image is from a May 19, 2011, briefing. The two hours required for the inspection was mostly consumed by the time needed to position the arms and boom; the actual scans of the damaged area, which began at 3:25 a.m. EDT (0725 GMT) and included five different angled-views, took about just a minute to perform each. The images collected by the inspection were beamed in real time to Mission Control in Houston, where imagery experts will analyze the data for how deep the gouge is and what effects it might have to the integrity of the orbiter’s thermal protection when heated during reentry. 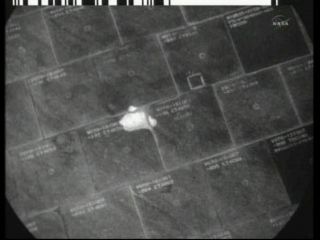 The small gouge was one of seven debris-damaged areas first revealed earlier in the week through photographs taken as Endeavour approached the space station to dock. This NASA graphic released May 20, 2011, (Flight Day 5) shows the location of damaged tiles on the belly of space shuttle Endeavour caused by debris during its May 16 launch into orbit. Four of the dings were considered very minor and were quickly cleared as safe by engineers. Of the remaining three, two were able to be analyzed using the available imagery. The third was "kind of fuzzy" in the available photographs, leading to managers ordering today’s focused inspection, Cain said. The survey came on a day of relatively light work for the six Endeavour astronauts. The crew woke at 9:26 p.m. EDT (0126 GMT) on Friday and had several hours of off-duty time scheduled before they were to start setting up for Sunday's spacewalk, the second of four excursions for the STS-134 mission. The shuttle and station crews were scheduled to take a special call from The Vatican to speak with Pope Benedict XVI at 7:11 a.m. EDT (1111 GMT). The papal call will mark the first time His Holiness the Pope has spoken to astronauts in space. You can follow Robert Pearlman @robertpearlman. Follow SPACE.com for the latest in space science and exploration news on Twitter @Spacedotcom and on Facebook.